Simpkin post-match (Rd 4, 2019) Jy Simpkin chats to North Media following our first win of the season. “Here we come”; that’s the message from Jy Simpkin following North Melbourne’s victory over Adelaide on Saturday night. The two-goal win was North’s first of the season, and one the forward hopes can kick-start 2019. “Once we got that first win, which we did tonight, hopefully we can get on a bit of a roll,” Simpkin told North Media post-game. Jy Simpkin’s personal form could also mirror the up-turn in his side’s performance, following a season-best outing against the Crows. After a slow start to the year, the 21-year-old showed glimpses of his form from 2018, collecting 19 disposals and taking eight marks. “I got involved early, and I got involved a little bit more than I did in the past few games,” he said. For Simpkin, maintaining an optimistic outlook was key to ensuring he could turn his form around. “It’s just about keeping positive and having all the boys around,” Simpkin said. “I just kept reassuring myself that I’m good enough to play at the level. There’s little time for North to savour the victory, with a very important match set for Friday. 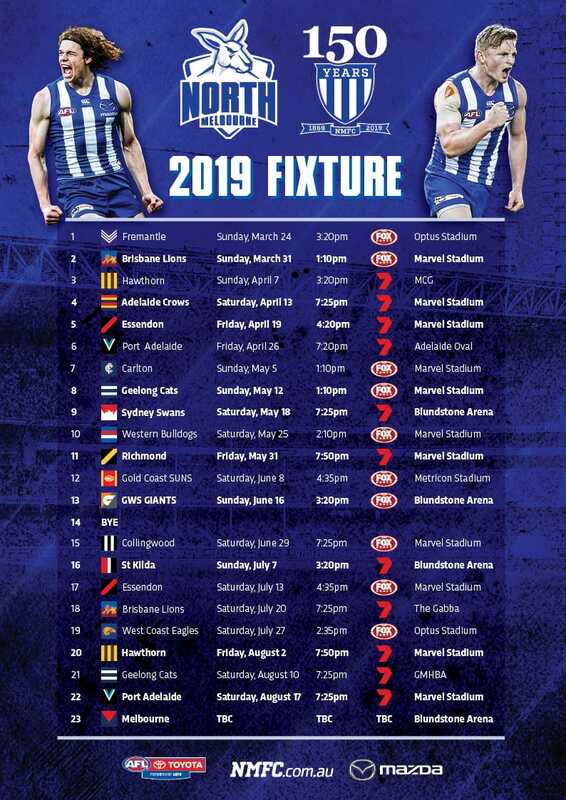 The Roos will host Essendon at Marvel Stadium in the annual Kick for the Kids match, with both sides coming off impressive victories. “It’s something we’ve looked forward to all year,” Simpkin added. “That’s the one circle we put in the calendar at the start of the year, and all the boys are looking forward to it.